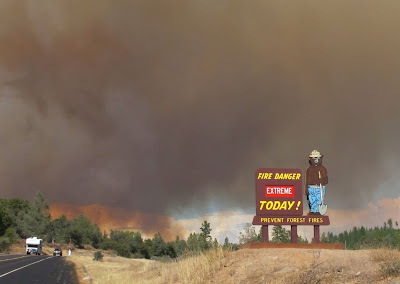 Traveling Sardine Class: Fire Danger Extreme! The accuracy of the sign is not lost in this view! It's that time of year: when people who live in or near forests are living on tenterhooks. You walk out the door and you feel it on your skin, in your nostrils, to the roots of your hair, even before any begin, it's fire season. It's always in the back of your mind as you plan what you would or wouldn't take, in the event . . . . You scan the skies, sniff the air, and don't breathe a sigh of relief 'til the season's passed and the rains have come. It's ironic, isn't it, that as the parched western forests burn, other parts of the country are drowning under torrents of rain. 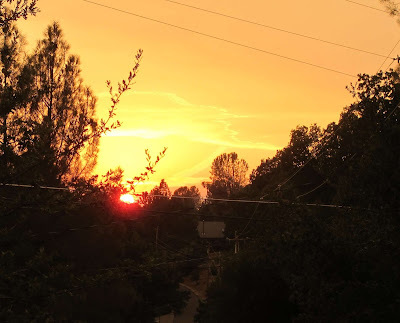 We've had hot spells this summer, including a record run of temperatures over 105 -- I was only home for the past two or three days of it -- but otherwise it has been a relatively (relatively, folks who've been complaining -- it is California, after all) mild summer. I had to take a bunch of outgoing mail to the post office on Saturday afternoon, and planned to swing by the lake on my way home to take photos of kids diving off the platform as an example of "exercise" for my photo a day group. 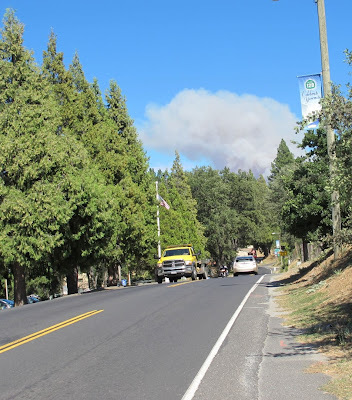 But as I pulled out of the post office and onto the highway through town, I saw this column of smoke rising straight ahead. So I headed out the highway instead, stopping periodically as a view and off highway stopping places were available. You can gauge the progress by the times under the photos. Looking back whence I came, where the heralds of a change of weather make a pretty pattern on a clear blue skies. I come upon a crowd of cars parked along the roadside, with people standing on the opposite side taking photos of the smoke, and the flames. Even here, near the fire, the wind is blowing away from the clear skies to the west ... to the west where I live. I decide not to continue on farther, and return home along the back way, which affords another view back over the canyons. I pointed my camera at a buzz in the sky, then cropped seriously. 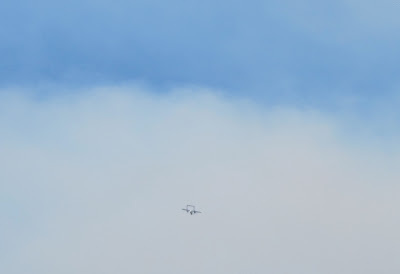 If you click on it, you may be able to see the little twin tailed plane. When there was a fire of several days a year or two ago, I looked up all kinds of information about different aircraft used in fire fighting. I don't remember the exact details, but I think this kind plane is involved in command and control. It's not a water or fire retardant dropping aircraft. There are helicopters and big planes to do that. There's a better picture there. By Saturday evening, skies to the west were still clear. Reports on the fire incident website put the size of the fire at 200 acres. Even while keeping an eye on it, we (by whom I mean I) felt like it would soon be under control. The only downer note is that "Growth potential" is listed as extreme. Sunday seemed uneventful to me on the fire front. I could hear heavy aircraft from time to time, no doubt carrying things to drop. I read that the airport was closed except to local residents who could only take off and land under restrictions. 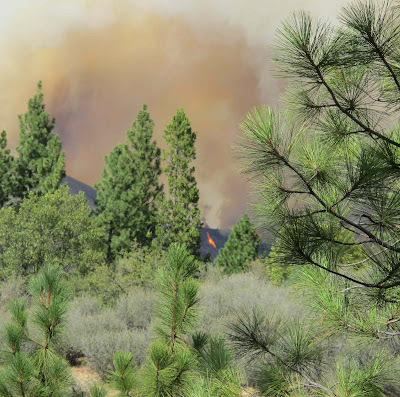 By evening, the size of the fire had doubled to 400 acres. I'd posted a fire collage in lieu of an exercise photo for the photo a day group, but felt like it was old news in terms of posting them here. Smoke in my nostrils first stirred me to wakefulness this morning (Monday, although this has slipped into Tuesday). When the sun comes up in the morning, there is a spot in its rising where it shines right into my eyes. 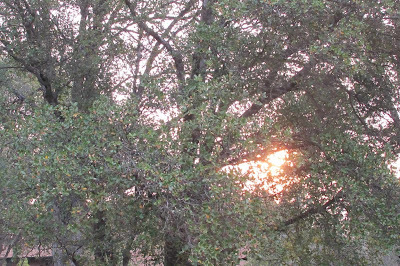 Today the sun is filtered with an orangey blur. Smoke in the air to the west. Smoke in the air to the east. The first report on fire size this a.m. was another doubling of acreage to 800. The smoke column from the direction of the fire is denser than the all-around smoke. Nervousness appears in Facebook posts. Local people know people who have been ordered to evacuate; some say they themselves have been ordered to evacuate, while fact checkers say no one right here has been told to evacuate. A friend has packed her bag. I gather a few things together in one place. There are travel things I store in my suitcase that is thus trip-ready at all times. The sun goes down in a red ball that my camera can't quite capture. A mid-evening acreage rises to 2200, then not too much later, to 4400. 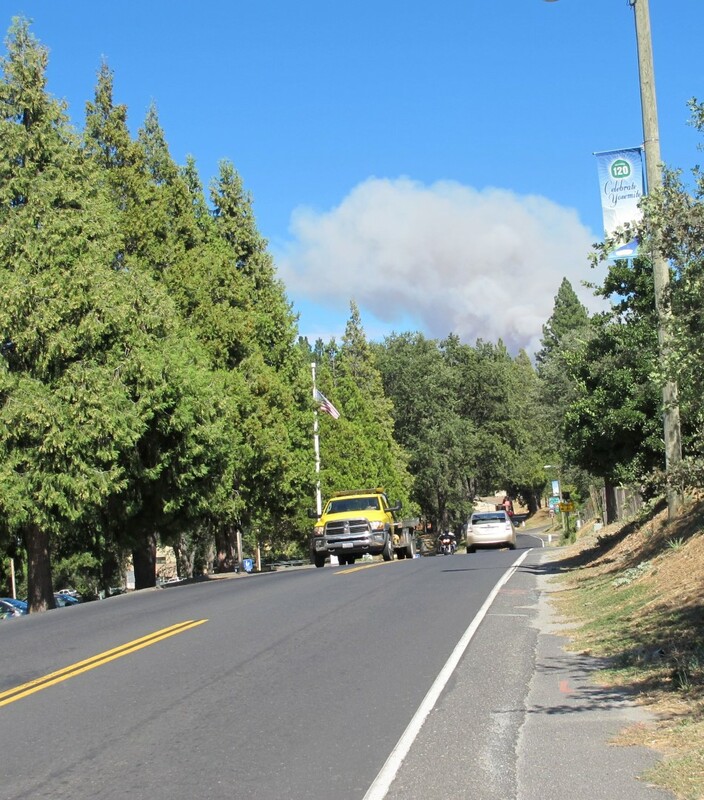 The main highway into Yosemite is closed for about 8 miles, as is a primitive access road down to the Tuolumne River. Residents of Buck Meadows have been evacuated, and the fire has jumped the highway southeast of there. I have all my windows closed tonight and the air conditioning on, so I don't know how much smoke there is out there. The TV news said the fire had turned back on itself as night fell, a good thing. But winds change. We have thunderstorms forecast and it takes lightning to make thunder, something we definitely don't want. You'll get this not proof-read. Corrections will follow another day. Terrifying! We've had several fires lately and I noticed the hillside just west of "my" new off ramp has burned recently. At that place, the freeway is built at the base of a hill and it's undeveloped, and steep. Stay safe, and indoors. Hope you are all OK. Since Black Saturday here in Victoria in 2009 we know how terrifying fires can be.